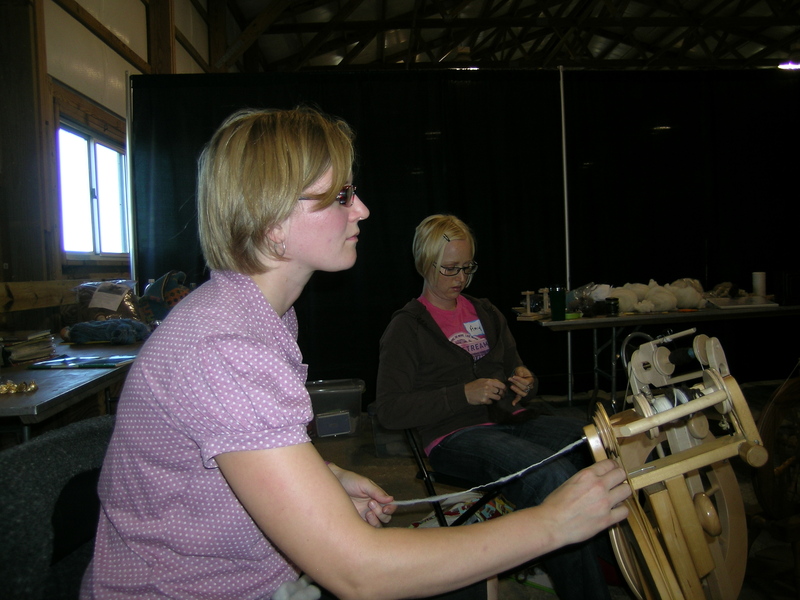 Part of my weekend at the Wisconsin Sheep & Wool Festival was taking a full day class in beginning wheel spinning. I was so excited to take this. 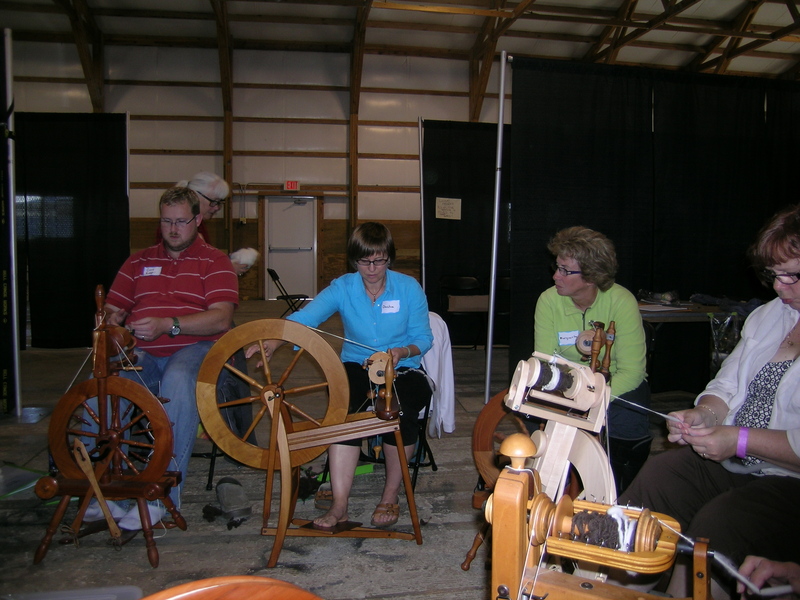 I have been thinking for years about having a spinning wheel and learning how to spin. I am not sure what was holding me back, but perhaps the empty nester syndrome gave me the courage, opportunity, space and time to consider learning this new task. The class was taught by Mary Underwood from Ann Arbor, Michigan. I had originally tried to sign up for the Sunday spinning class a couple of months ago, and missed the last spot by 5 minutes (registration initially went through, then I got an email that it had already been full). I agreed to be put on a waiting list, and fortunate for me, Mary agreed to teach this Sunday class. I was joined in the class by three friends, Manning, Amy and Christina. 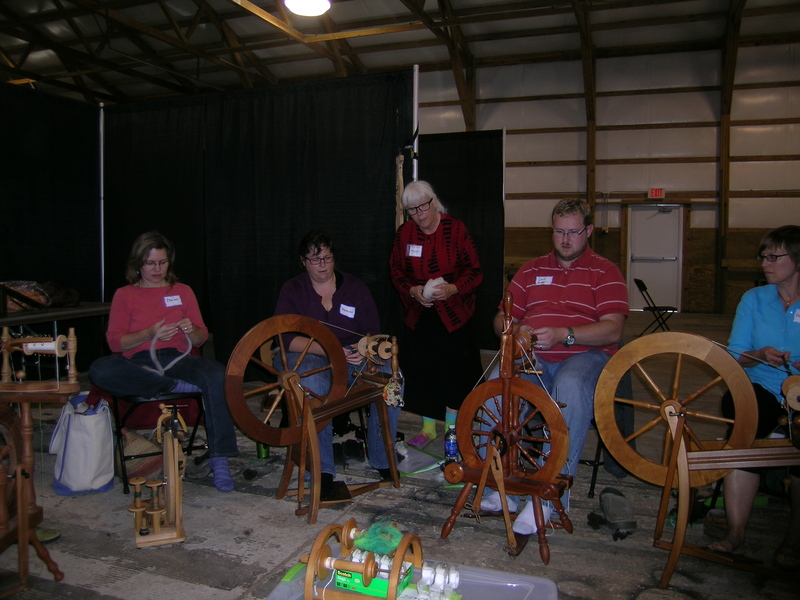 As fate would have it, I was looking online earlier in the week at spinning wheels that would be good for a beginner. The class allowed you to rent a wheel for the day to practice on. 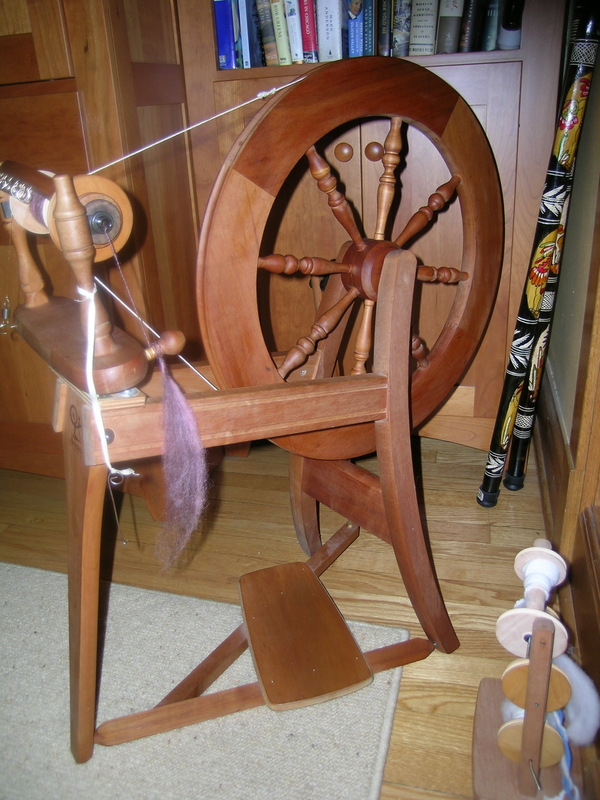 I had arranged for the rental, then saw a posting on Ravelry in my guild’s forum of a spinning wheel for sale. An Ashford Traditional, one recommended by many as a good beginning wheel. The seller lived a bit outside of Chicago, but was going to the Wool Festival, and would meet someone there. How perfect! I agreed to purchase this, sight unseen, knowing nothing about wheels. I picked it up at noon on Saturday, and with my husband’s help, took it to the class. I was able to make my first spinning attempts on my own wheel! My spinning in the morning was much better than the afternoon. Life was busy when I got home, and I just tried it last night again, the first since the class. 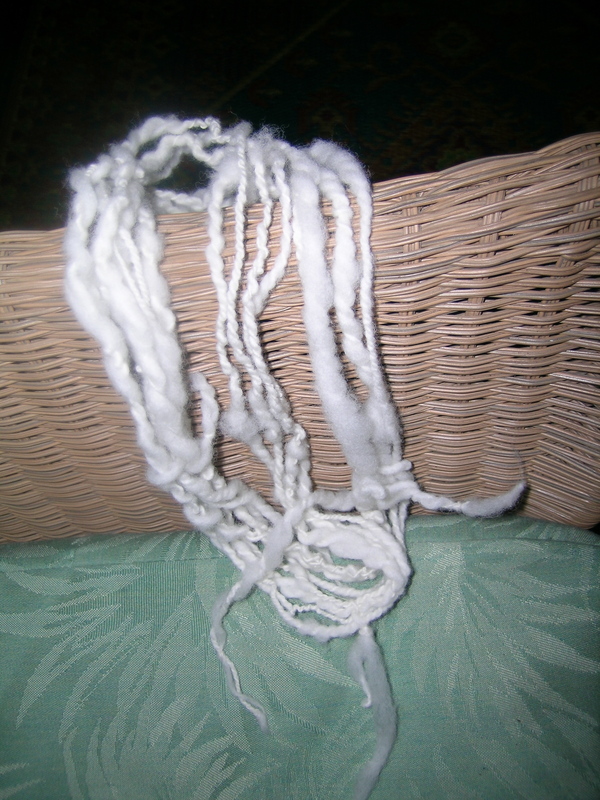 I started to get the hang of it, but quit when the fibers became too bulky. I need to really work on the drafting of the fibers. You have to pedal with your feet, draft the fibers with one hand, and control the twist and take-up with the other. Much more complicated than standing on one foot and rubbing your belly! I watched several YouTube videos yesterday before trying spinning again. 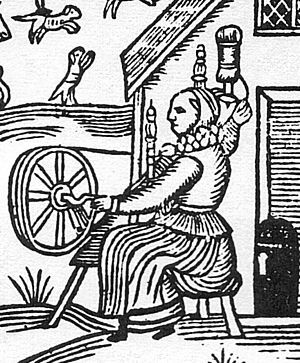 I found this one helpful in going over the basics mechanics of the spinning wheel, and this one great for a beginners refresher course on how to spin. This woman has several other spinning videos which I am sure I will visit often. It is recommended to try to spin for just 10 minutes a day at the beginning. I had my first spinning dream last night. I was doing quite well. Looks like you had a great time. Don’t you love watching the sheep dogs–maybe you will have to get a friend for Lloyd after-all. I have always been amazed watching people spin. I am sure you will soon become an expert and do wonderful work just like everything else you set you mind too! Have you really looked at the first spinning sample? I have quite a bit of way to go. Thanks for the encouragement though. I took this class with you! I had a great time. I am thinking of taking another class. I went to the local Spin in Public Day and they set me up with a wheel and I was trying my hand at it again. It is so addictive. It is! So glad that you found me. I loved that class, and Mary is a great teacher.